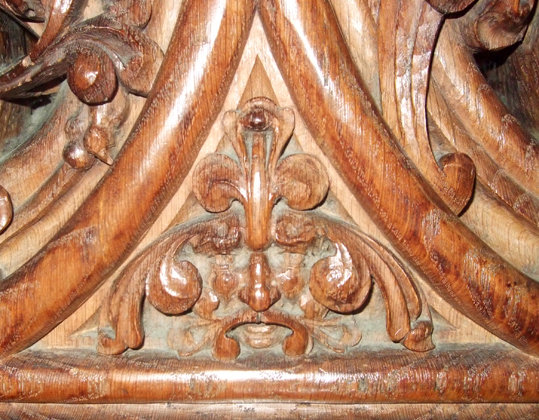 The Green Man - often depicted as a face surrounded with leaves or with foliage sprouting from his mouth - is one of those enigmatic images that many people consider to be pagan, but which is most frequently found in decoration within churches. Last week, between visiting Stonehenge for the Summer Solstice and going to Glastonbury Festival, I went to Salisbury to get my camera mended. While I was there I decided to visit Salisbury Cathedral and look for the Green Men that are hidden within it. Finding them wasn't easy. In fact, even finding someone who knew anything about them was quite hard and led to a quest that felt almost like something out of a Dan Brown novel. I first asked the staff on the desk at the entrance when I paid my recommended donation of £7.50 to go inside. 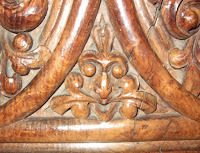 They had never heard of the Green Man, but suggested I ask one of the many tour guides. The first one I asked told me where to find one of them (pictured at the bottom of this page), but was too busy to do more than that. The second looked shocked that I was interested in "those pagan effigies" and hurried away. However, a woman overheard me asking and said that somewhere in the cathedral there was a copy of a long out-of-print guidebook called Salisbury Cathedral's Green Men. Well, that sent me on another hunt - to find the guidebook - which another member of staff eventually found at the back of a desk drawer. The booklet was written about a decade ago by one of the cathedral guides, Roy Whitehead. 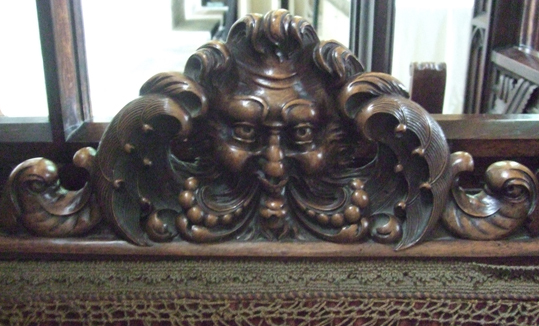 He apparently had a fascination for Green Men and found dozens of them hidden away - including one that he thought was actually a Green Woman. Some dated back as far as the Middle Ages, while others were Victorian. Some were on tombs, some on the ceiling, some on walls. 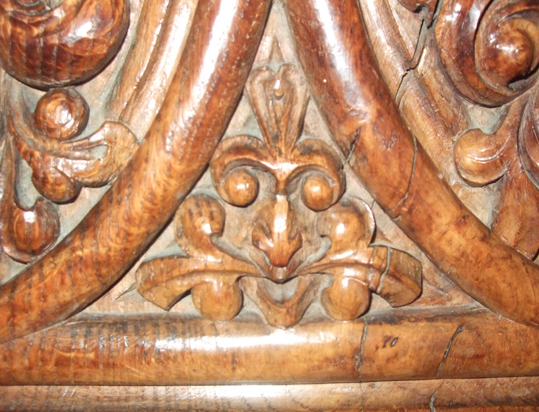 The most impressive one was on the back of a beautifully carved chair used by high-ranking members of the clergy (pictured top) and the oldest were on the backs of the misericords - folding wooden seats - in the quire. 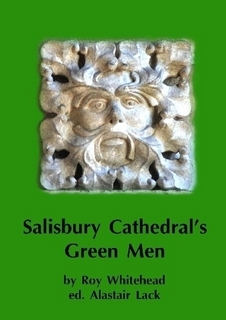 Salisbury Cathedral's Green Men is full of information and photos - and also contains maps of where to find them, But even with the maps I was struggling to find more than a few until another guide came to my rescue. He had never before seen the guidebook I was carrying or heard about the cathedral's Green Men and was so fascinated he joined me on my quest. 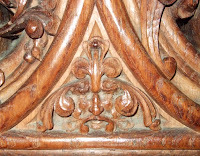 He even let me into the stalls of the quire, which are normally out of bounds, where we crawled along the floor looking for the tiny foliate heads that were hidden at about ankle height. I didn't manage to find all the Green Men in the building, but I did find quite a few. Some were in places that were simply too hard for me to photograph. Of course, the big questions are, what do the Green Men really mean and, as Roy Whitehead asks in his guidebook: "Why is it that what appear to be Pagan symbols such as the Green Man are so common in the older Christian churches?" The guidebook doesn't attempt to answer either question - it merely gives factual details about where they are and their history. Roy states: "There are many theories, but it is not my purpose to investigate them here." 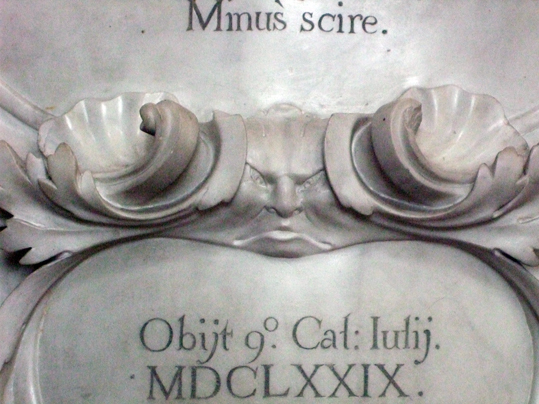 Another book that is due to come out this August does look into one theory as to why the image of the foliate head is so widespread and what it might mean. The book is called Revealing the Green Man by Mark Olly. 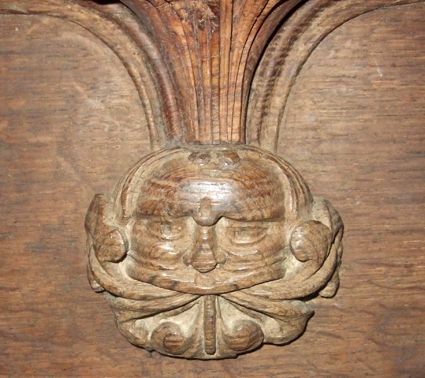 Mark suggests that the Green Man was an ancient pagan deity representing the force of life and that his followers continued to place his image into religious buildings even after the rise of Christianity. Whether that is true or not I don't know, but it is an interesting and appealing theory. If you ever go to Salisbury Cathedral and want to quest for its Green Men yourself, I recommend it.